aCoDriver 3 - a virtual passenger! If an application promises its value as being worth thousands of dollars, this naturally arouses a little interest and suspicious curiosity. aCoDriver 3 turns your smartphone into a virtual driving assistant that, when necessary, can take the driver by the hand, and help get you where you need to be. Whether our test candidate will meet your expectations you will learn in today's review! Note: aCoDriver 3 was designed to pick up on European traffic signs. Individual results may vary. Before you can get to the range of functions our test candidate boasts, you must first meet some basic hardware requirements. Today's test was performed on a Nexus 4, which easily met the processing needs, but if you have an older device you can see the exact requirements you will need in the AndroidPIT App Center or Play Store description of the aCoDriver 3 app. These requirements can be explained simply via the app's functionality. Because aCoDriver 3 needs to observe traffic conditions with the main rear camera of your smartphone it helps if you actually have one, and without GPS you're going to have a hard time pinpointing your location. Likewise, the processing power required to perform the various calculations, combined with location determination also require a decent processor and sustained battery life. Nevertheless, a charging cable for the car is advisable. But aCoDriver 3 offers more than just determining your vehicle's current location. In the spirit of a travel assistant, or a well-informed passenger, the application analyzes both on and off road events and can thus provide the driver with useful information while they are behind the wheel. The functionality is as impressive as it is accurate. The current speed limit, for example, appears to be very reliable because it is not based on pre-set data as the case with many other navigation systems, but instead by what the camera actually sees on the side of the road. Speed limit signs are scanned as you drive past and are displayed to the user on the dash-mounted screen. During the test period this function was of tremendous value, especially in the vicinity of construction sites. The rest of the functions are just as impressive in the first hours of use. For example, the distance warning is something I only know from new car models that have built-in additional equipment. Likewise the Lane Assistant is likely to be an asset for many users. This alerts the user when you are entering a closed lane (eg on the freeway). Behind this simple display of various hazards is a sophisticated system that includes a large number of tricky scenarios to warn the driver at an early stage. On well-known routes this might not make much sense if you are familiar with any roadworks, speed limits and so on, but on unfamiliar sections of road this can be a real life saver. Regardless of how great the app may be though, the limiting factor is that nearly all of aCoDriver's functions depend on the quality of the camera in your smartphone. 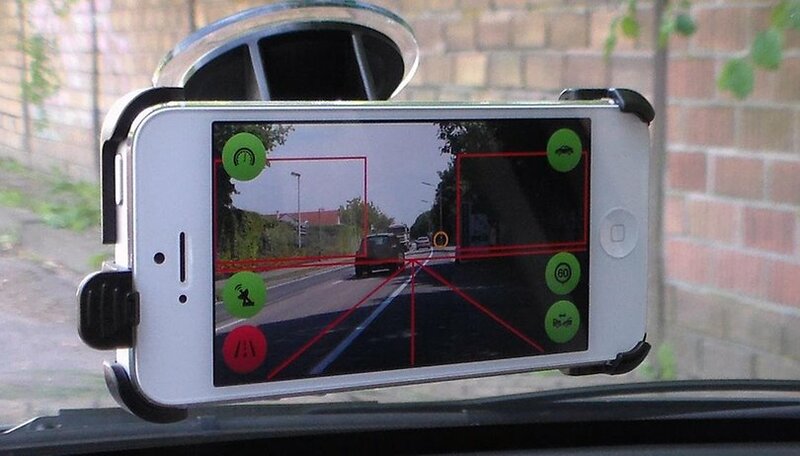 For that reason alone, a good smartphone camera is worth its weight in gold when used with aCoDriver 3. The problem here is that at night (understandably) the scanning of signs is not as accurate as by day. You're not lost after dark however, as the app will still display speed limits based on your location, but in new construction sites or on roads unfamiliar to the app's database, the driver is on his own. The same night time camera limitations were also true for distance detection, with less accurate performance at night (including the lane warning system to a certain degree). Although the latter made a good impression the majority of the time. The developers behind aCoDriver are not resting on their laurels either. Over time, additional features are constantly added, and the current status quo only makes you want more, which they are continually delivering. Thus, in the last version, the feature was introduced to save camera images. This means you can document your journey as you go, which could come in handy simply as a nice reminder of a holiday, or in the case of an accident. The question the user must ask themselves here is whether the additional space and battery used for this feature is justified by its possible use-value. I personally would like better control over the many widgets that display various data within the application. While they provide convenient features, they also overload the display a little. My biggest "complaint", however, is that the aCoDriver 3 app runs in the foreground, making the use of a simultaneous navigation tool impractical. The driving assistant meets the tasks expected of it, but during the trial period I had always to have strive my real passenger switch between a navigation app for directions and then back to aCoDriver for general driving. An integrated navigation and driving assistant would be a real asset, or alternatively, aCoDriver could run as a background app and display only the information you need so you could use a navigation app at the same time. The general operation and graphical presentation of the application are consistently at a high level. The elements are kept subtle and intuitively convey, through color codes, the status of the various functions. aCoDriver 3 on the Nexus 4 always ran fluidly. It also worked smoothly on the One X. Crashes were non-existent. aCoDriver 3 is available for free. The application is also ad-free. The simultaneous availability of aCoDriver Free, Basic and Pro is a bit confusing. In version 3, the three editions were brought together - for simplicity's sake. aCoDriver 3 is an absolute recommendation. The application has really impressed me during the test period and was, particularly on unfamiliar routes without need for navigation, a real asset. The limitations of your device's camera are important to note, but if your camera provides good enough results any minor issues are compensated for by the overall impression, and for a free app it's definitely worth trying out. For regular drivers though, the lack of concurrent aCoDriver/navigation is not really practical and thus the user must always make an "either-or" decision. It's very interesting how with the help of a camcorder and an intelligent and real-time image processing software, you can get assistance for the driving time, for example. The same processing can be applied to other scenarios, among the most diverse, helping to assist people with various handicaps, or even in the field of science and research in the field of autonomous robots. In 3.1 we added a feature to detect variable speed limits on sign bridges. The feature needs to be enabled explicitly in "Settings - Speedsigns - Variable signs" as it requires additional resources and is beneficial for drivers in urban areas only.